Matt Lewington from Enhance Physiotherapy Albury Wodonga speaking about tendon pain and how to best treat tendons to get you back achieving your goals faster! Whether it be your achilles, patella tendon, lateral hip, shoulder or elbow – tendon pain can be very debilitating when it comes to achieving your goals and participating in your every day activities. In the last 2 weeks I have treated 12 new patients who have presented to our clinic with tendon pain! Some have recently started back exercises after a month off at the end of football and netball season, others had increased their loading coming into the Melbourne Marathon while some had just simply increased their daily activity with the nicer spring weather that is upon us. when you are experiencing pain in your tendon it is your tendons way of telling you that it is overloaded and that is requires some ”relative rest”. This is most common with high intensity, dynamic activities such as running, jumping and throwing. it is important to continue loading your tendon. If you rest from activity your tendon will feel better and your pain will decrease, however, your tendon’s tolerance to load will also decrease. When you return to doing your previous activities your pain will return, often worse than it was previously due to the deconditioning of your tendon from being unloaded. when you experience pain and tightness that is associated with tendon pain it is very common to try stretching the tendon or getting a massage to help with your symptoms. Tendons are very different to muscles and do not respond well to stretching or massage – these strategies can actually make your tendon pain worse! If you are experiencing tendon pain, or want to know more about how to get the best results for you so you can achieve your goals faster book in now through our online booking portal on our website or Facebook or call our clinic on 6041 3609. 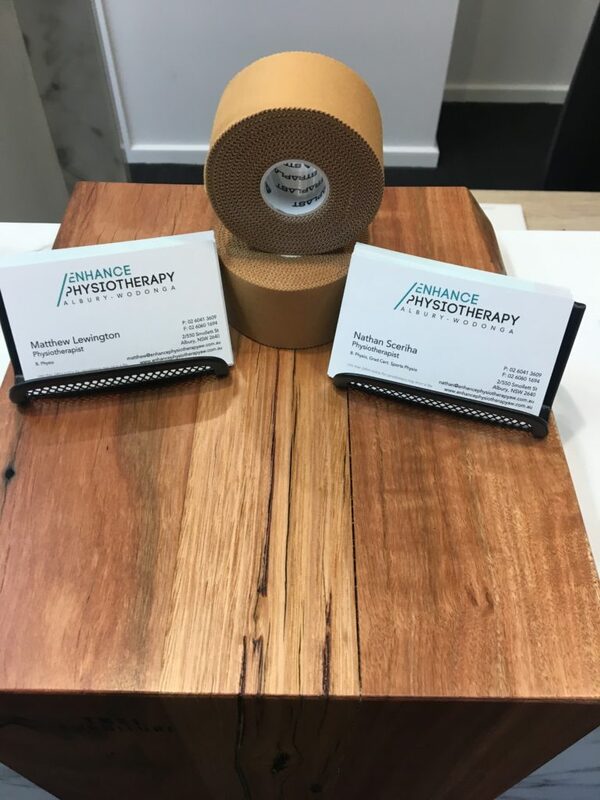 Located at the Enhance Physiotherapy Clinic: 550 Smollett St Albury. Ideal for sports trainers heading into preseason. Please contact the clinic on 02 6041 3609 to secure your place. Learn from physiotherapists working in the sports field! As physiotherapists who work closely with sports teams and the Australian Defence Force, a fair proportion of our work consists of loading issues. “The Envelope of Function” is a great analogy, when discussing injuries related to loading. If the load fits within your “Envelope of Function”, you will have a normal loading and tissue response, which adapts quickly without injury. However, occasionally the load can go outside your level of function resulting in injury. This typically occurs in two ways. The first way involves increasing your load quickly. There is no change to your functional capacity (or Envelope of Function), however you may have increased your load beyond this capacity. An example of this is doubling gym or running sessions to make up for missed sessions. The second way is maintaining the same load, however your “Envelope of Function” has decreased. Factors that contribute to this decrease include; pain, stress, poor nutrition, fatigue, insufficient recovery or poor sleep. These factors can often explain why an overuse of loading injury has occurred when you have not altered your load. If you have any loading injuries, please contact Enhance Physiotherapy Albury-Wodonga. We will fully assess your injuries and get you training back at your peak. A tour of our clinic, with Matt and Nathan showing the way!